“My fellow Chairmen. It is an honour for me today to make my first address as the new President to such an august group. Groucho Marx’s famous quote, “I don’t want to belong to any club that will accept people like me as a member” raises serious questions – should that be doubled for any club that would have people like us as chairmen, or perhaps tripled for any club that would accept Mainelli as president. I had a delightful farewell lunch at the Guildhall with Sir David Lewis last week, when Archie Galloway shared a copy of Matthew Norman’s 2005 Sunday Telegraph restaurant review for the short-lived Throgmorton Restaurant in our ward. Some of you may remember this ghastly restaurant of “insane décor” down in the dungeons under Drapers Hall. The review included phrases such as “more in pity than in anger”, “the first warning of the ensuing horror comes from the scent (eau de cottage hospital mingled with essence of mothball)”, “delayed shock, perplexity and something close to disbelief”, and “gizzard of syphilitic mountain yak”. We were surprised the Telegraph’s legal team allowed publication. The review concluded with a score – 0.07/10. So this afternoon’s question must be, how would we score Broad Street Ward Club and her chairmen? From the Ward’s first mention as “Bradestreete” in 1293 it has been a place of exchange incorporating the Stock Exchange, Royal Exchange and Bank of England. The original ward was a bit larger, encompassing Broad Street Rail Station and going on down to Cornhill including Gresham’s Palace and the Merchant Taylor’s. Our ward club’s origins go back to at least the 18th century, when we had a volunteer militia under Alderman Richard Clarke (1797). But the true founding of today’s ward club was on the night of 19 October 1976 at Carpenters’ Hall when Sir Hugh Wontner and a number of electors formed the club. Sir Hugh was followed by Christopher Collett and then Sir David – all three staunch supporters of the club. 37 years later the club has grown over the years in at least three ways – from 100 to 200 to now 303 members; to having held over 500 events over the years; and probably also grown many of our waistlines. As for the ward’s future, we members are developing a “Venn diagram” strategy where we seek to place the Ward Club even more firmly inside the electorate, which can only lead to yet more success for the Club. I am honoured to have the support of three excellent Councilmen, all of whom are former Chairmen – Deputy John Bennett, John Scott and Christopher Hayward. I don’t know what the collective noun is for chairmen – a set of chairmen, a fold, a board? But succession is the collective noun for Broad Street. Successful committees, successful secretaries, successful chairmen. 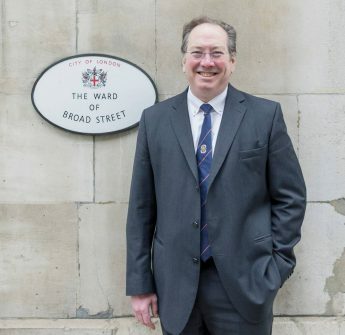 It is you, a succession of successful chairmen that have made Broad Street Ward Club the success it is today – the largest and most vibrant of all City ward clubs. Totally deserving a 9.93/10, and that remaining 0.07 is really just there to give future chairmen something for which to strive. 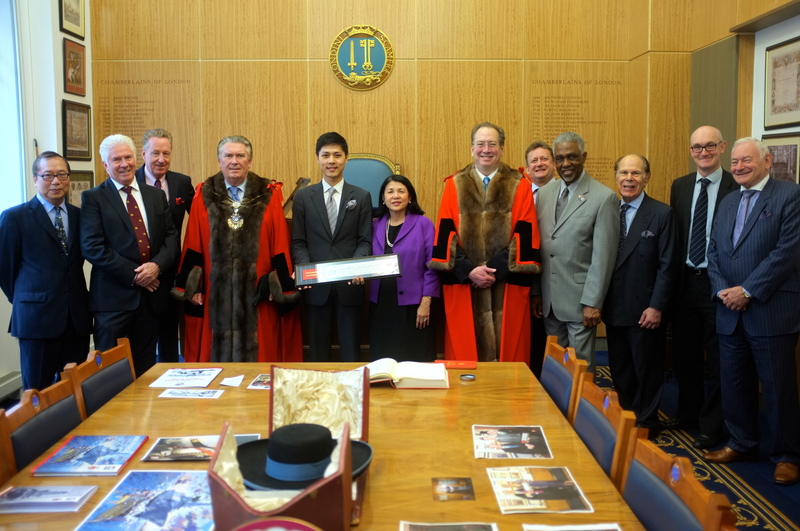 Yesterday I had the privilege of attending my first freedom ceremony in official garb, alongside Paul Judge, to welcome Lui Hui to the freedom of the City of London. Lui has been a big help on City-Asia relations and it was a delight to see him again. He brought along a wonderful set of friends to help celebrate. Officiating, Murray D Craig, Clerk of the Chamberlain’s Court, City of London, gave yet another witty, authoritative and personal talk after the official ceremony. Murray ranged widely and eruditely through battles and cricket (Lui’s entourage were off to the Chinese Cricket Club for a celebratory lunch), as well as connecting with kings and presidents who had taken the freedom, recognising Lui’s Macanese and Portuguese connections. The traditional celebration, even without Portuguese connections, was served by the Beadle, a glass of Madeira, despite the 10:30am ceremony. We toasted the health of “the youngest freeman”, well the youngest until the next swearing in about an hour later. If you’d like to consider the freedom given a love or connection with the City, please just ask at the Chamberlain’s office. 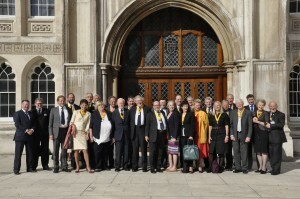 For a bit more detail, here is Murray’s wonderful 2011 Gresham Lecture – “Sheep Across London Bridge: The Freedom of the City of London“. One of the great City traditions is welcoming new freemen. Yesterday it was my privilege to welcome my first while in official attire, Lui Hui. Lui has been a big help on UK-Asia relations and brought along a great group of friends. Murray Craig, the Clerk of the Chamberlain’s Court, City of London, gave yet another bespoke, witty and engaging talk, with references to great battles and cricketeers (Lui and the team were off to the Chinese Cricket Club for lunch), as well as former freedoms for Portuguese kings and presidents in honour of Lui’s Macaand Portuguese connections. We also celebrated the admission of “the youngest freemen” (well, youngest until the next one came in about an hour later) with a traditional glass of Madeira – despite it being 10:30 in the morning. The glass of Madeira applies even when there are no Portuguese connections! If you would like to consider the freedom, given a strong connection or love of the City, please do contact the Chamberlain’s office. And if you want to read more, here is Murray’s wonderful 2011 Gresham lecture – Sheep Across London Bridge – The Freedom of the City of London.